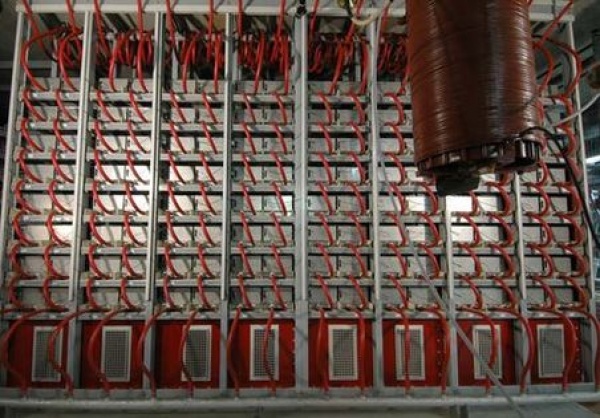 High Voltage Loads (such as tubes, RF generators, Gyrotrons, Tetrodes, Klystrons, IOTs). This high performance power supply is suitable for almost any high voltage application. It offers high accuracy on the output voltage and excellent dynamic performances combined to high operational flexibility, high availability, low maintenance requirements, high efficiency and low impact on the grid. The topology is based on a modular structure with a large number of elementary IGBT-based power modules; with this solution the voltage can be modulated in a very fast way to obtain the desired output voltage by using a proper switching strategy. This modular structure is characterized by redundancy in order to increase the fault tolerance and the reliability of the system. The modular approach also improves maintenance and servicing, simplifies the managing of the spare parts and reduces the life-cycle cost of the installation. The P.S. is made of a relatively high number of modules to keep the individual voltage step below the specified ripple, so reducing the constraints on the dimensioning of the output filter which has an important impact on the energy delivered into an arc in the load. In this way it is achieved a quick switch-off time, which limits the total energy discharged in an arc to less than 6 J, and which therefore protects the load in a very effective way. Furthermore a newly conceived Passive Voltage Limiter capable to withstand the high dV/dt present at the MHVPS output was used to shutdown the Power Supply output within 2 µs in case of over-voltage events. The modules arrangement and their modulation strategy make the P.S. to draw energy from the electricity main with a low impact on the grid: the power factor is 0.98, the current harmonic content is very low, and the efficency is high. The solution is available for a wide range of power and can be easily redesigned for custom needs. In particular, this topology has been specifically implemented to drive the cathode electrode of the 2 MW RF Depress Collector Gyrotrons and is installed in the European Electron Cyclotron Test Facility in Lausanne. Similar modular P.S.s have been delivered to IBA.